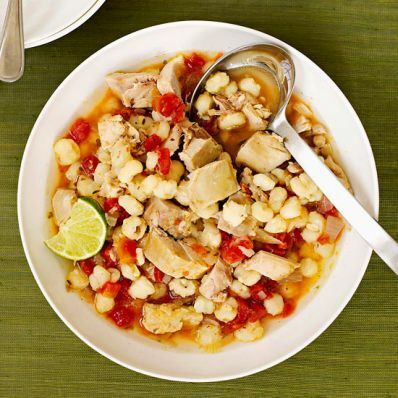 1 of 2 Combine, garlic, chicken, hominy, onion, oregano, cumin, red pepper flakes, bouillon cubes and water in slow cooker. Cover and cook on HIGH for 3 hours or LOW for 5 hours. 2 of 2 Remove cover and stir in tomatoes, lime juice, salt and pepper until warmed through. Serve imediately.